Now, here’s a Nintendo Switch game that is destined for the bargain bin. Inland Productions, Ubisoft Barcelona, Torus Games, and Virtuos have all tried their hand at turning the live motorsport spectacle that is Monster Jam into a game, with middling success across the board. Team6 Game Studios now find themselves behind the wheel, and, even with the chance to learn from the previous efforts to crack the experience, end up delivering the most lacklustre entry to have ever graced a console. Monster Trucks are towering machines, in that they are modified pickup trucks with a larger suspension and oversized tyres that are predominantly seen at event shows across the United States. Whether challenging drivers to race their way around muddy arenas or to take part in freestyle competitions in which they are given a set amount of time to demonstrate their skills, Monster Jam: Crush It! has enough to build a game around – even if they don’t go as far as to present a chance for players to learn more about the drivers at a virtual Pit Party. 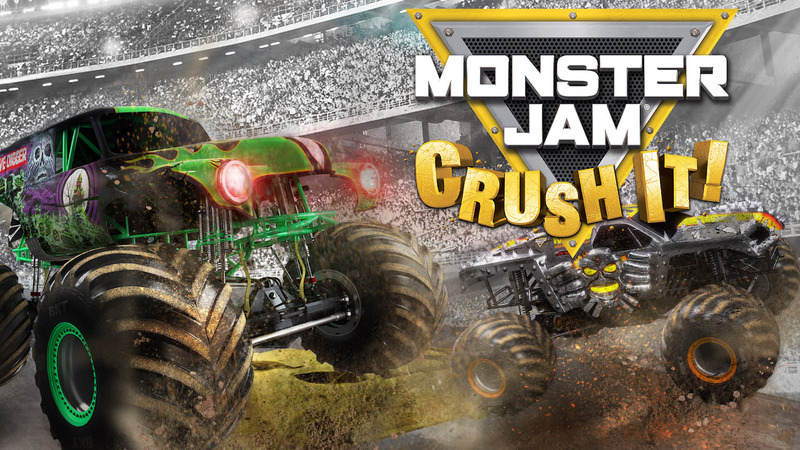 The developer at least lets you choose how to spend your time in Monster Jam: Crush It!, with Stadium Races, Stadium Freestyle, Hill Climb, and Crash Mode awaiting your selection on the main menu against the loud and cacophonous soundtrack that only adds to the player’s ever-increasing level of irritation with the game. It’s not a good start, then. To break it down, Stadium Races simply see you outrun your competition – making your way over dirt mounds to highlighted checkpoints in an effort to cross the finish line first. Stadium Freestyle challenges you to perform wheelies or barrel rolls, frontflips, and backflips after using ramps to get Air Time and score points, with Hill Climb throwing in three modes in time attack, stunt, and survival – seeing you make it to the finish line as quickly as possible, performing spectacular stunts once again, or doing your best to swerve around explosive barrels. Lastly, your aim in Crash Mode is to destroy targets to rack up points, which is easily the weakest of the lot. As can be expected from the control scheme, the A Button (or ZR Button) is used to accelerate with the B Button (or ZL Button) used for braking and reversing. Then, the Y Button can be used to steer more sharply – which, in turn, can see you perform donuts – with the Left Stick used for steering, and the Right Stick used for air control. The problem, though, is that, even early on, it soon becomes apparent just how poorly the game handles – an issue that is compounded by a poor physics engine that soon results in the player never really feeling like they are in control. That hampers the experience in Stadium Races, Stadium Freestyle, and Crash Mode, with Hill Climb left standing as the only marginal success in Monster Jam: Crush It! – thanks to the fact that it is played nearly side on and locks your trajectory, leaving you to concentrate on uncontrollably pulling off unrealistic flips and rolls. Even in Stadium Races, the CPU-controlled trucks would spin out for no obvious reason. I continue to feel bemused by it all. While success in events will earn you the opportunity to drive more trucks and unlock new levels to take on, Monster Jam: Crush It! still manages to feel anaemic in content. That can be blamed on how the developer has seemingly been forced to pursue authenticity, left to recreate six real-life stadiums that are used for the events – that include the site of Monster Jam World Finals, Sam Boyd Stadium. That doesn’t mean that Team6 Game Studios couldn’t have played around with different layouts within the stadiums, though. We’re instead left with just 12 Stadium Races, 6 Stadium Freestyle events, and 9 courses in Crash Mode. Hill Climb has clearly been given the most attention, with 28 courses split between Forest, Desert, Polar, and Harbor areas, even if they, too, don’t feel particularly imaginative. And, really, that lack of creativity permeates Monster Jam: Crush It!. Monster Jam: Crush It! promised players the chance to take control and experience Monster Jam like they have never seen, but it fails to ever entertain. There will be those that may blindly enjoy playing as their favourite Monster Jam trucks, but it doesn’t hide how pitiful this game really is – an effort that would look more at home on mobile rather than seeing release on Nintendo Switch and other consoles before it. At least there’s a button dedicated to pinging fireworks in every direction.